Cannoli Kitchen is not only one of the best Italian food restaurants in Boca Raton, but we are also experts when it comes to serving up the most authentic Italian food in the South Florida area. What many people may not know is that some of our classic Italian food dishes do not actually originate from Italy. Below are some of our favorite American-Italian meals that keep us coming back for seconds. As a baked pasta casserole made with ziti pasta and sauce, baked ziti is a form of pasta al forno. Even though baked pasta dishes date back to the Middle Ages and the Renaissance, baked ziti originates from Italian-American cuisine. 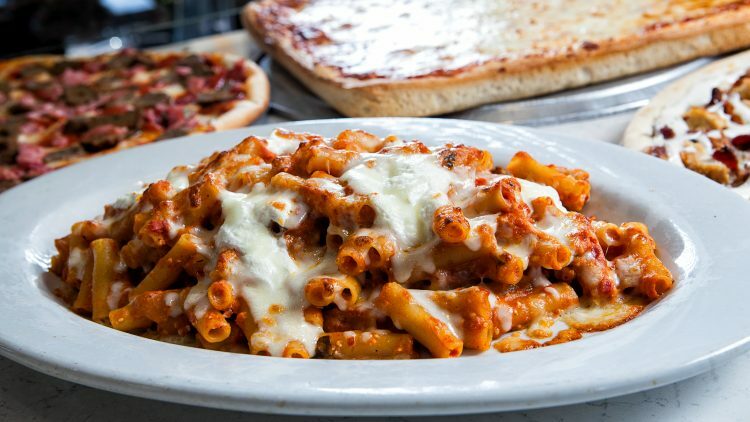 In many recipes, the ziti is cooked first, separately, while the tomato and cheese sauce is prepared. The sauce can be made with a variety of ingredients, including meat, mushrooms, peppers, and onions. After the ziti has been cooked and drained, it is then combined with the sauce and layered with additional cheese and baked in the oven. This classic dish has remained a staple throughout the decades in Italian-American families. Another Italian-American favorite, chicken parmigiana, also known as chicken parmesan, was invented by Italian immigrants, who came to the United States. This classic Italian-American dish is a version of eggplants parmigiana, which originated from Sicily. Chicken and veal were most likely substituted for eggplant because it was less expensive and more readily available than in Italy. This dish consists of breaded chicken breast topped with tomato sauce and mozzarella, parmesan or provolone cheese. As one of the best Italian food restaurants in Boca Raton, Cannoli Kitchen delivers authentic Italian food, straight to your door. We offer a variety of pizza and Italian food dishes, which are made using the freshest ingredients and highest quality of meats. If you would like us to cater your next event, give us a call at (561) 955-8880.